In my experience reading through the existing documents and reviewing relevant literature is a challenging job in the research process. The process of reviewing literature continues from the beginning of thinking about research to finalising a research paper or thesis. I believe that a researcher begins a research right from the beginning to think about what the research problem is and explores relevant information to the research problem. A researcher uses own bank of knowledge and various documents as a reference to define the research problem. However, it is not an easy job for anyone to explore resources and to find relevant information in the resources. Here, the researcher needs to have skills in reading documents and reviewing the literature and most importantly select the right resources from a vast ocean of resources such as the physical library, digital library and websites. Let me share my experience of exploring resources, finding right documents, reading through lines and picking relevant information from the documents. When I started my second Masters in Education at the University of Bedfordshire in England in 2009, I struggled a lot to understand and learn the way of searching documents in both physical and digital libraries and had to wriggle when I was unable to recognise right information in the available resources. I cannot remember how often the library liaisons and tutors helped me explore digital books, journals and website information. It took a while to recognise the right information in journals, book chapters, newspapers and websites. I believe the way I learnt to read documents and review information relevant to research problems, questions or purposes is a generic skill needed for researchers to review literature. As you read a document, remember what to review. The above diagram (Presented by Professor Janinka Greenwood in the Creativity & Change Lab at the University of Canterbury) provides a fundamental guideline for reading documents and reviewing literature. The circles are interconnected in a literature and having the diagram on their mind can help a researcher to explore the right information in the documents and review literature systematically. The Topic in the diagram refers to the research topic. As a researcher or writer one needs to have a clear topic or the area to explore the right documents and the information within the documents. Moreover, the key aspects in the documents need to be relevant to the researcher’s own research area to relate the literature of the document. On the other hand, the Context in the diagram refers to the context of the research that the researcher has focused. When reviewing literature from journal articles, book chapters or other resources, a researcher needs to locate the context of the research information in the documents and provide the context in own review of the literature. The information becomes meaningful only in the contexts, the researcher must consider the context as an important aspect of the literature review process. The next important aspect of the literature review process is the Intention of the researcher which helps to read a wide range of texts in a document and explore the right content s/he wants to draw from the document. Another important aspect is the Criticality. The researcher needs to analyse how the information of the document relates to the topic and interpret it. It is a very important aspect in the process of reviewing information and interpreting in the body of literature because there is always a chance of biases. The researcher needs to reduce prejudices in the reviewed information. When I started my doctoral research in education at the university, I got a good platform to learn reading skills and the skills of reviewing literature. Regular seminars in our research lab provided me with more opportunities for learning the strict discipline of reviewing literature such as exploring archived documents in a digital repository and printed materials, selecting right documents, scanning and skimming information in the documents. A researcher can use keywords and phrases to explore relevant materials available online from google, google scholar, EBSCOhost, digital library, etc. Similarly, the key terms and ideas of research can be helpful to select relevant books, journals and previous theses in the physical library. Moreover, the key ideas (specific topics) of the research can lead to reading through journal articles, specific chapters of bulky books and other documents. When reviewing literature, the researcher needs to have specific ideas to pick information from the resources such as journal article, book chapter, newspaper or other web pages and to interpret the information without any prejudices. The above diagram gives an idea to follow reading documents and what information to be reviewed from the resources. While reviewing any literature or a journal article, the researcher needs to bear in mind: who the researcher is, when the research was published, what the research is about (topic/ area), where the research took place (context), how the research was conducted (methodology) and what the results are. I believe that these key ideas help the researcher explore relevant information from documents, note key information when reading, interpret the information systematically and save valuable time. Many formal and informal discussions emphasize that developing EFL reading at public schools of Nepal is challenging. In this narrative writing, I am therefore trying to investigate the existing scenario of EFL reading in our public school, its impact on developing reading habits and some hints for promoting it. Let me share an incident that took place in my class. I asked a student to read a simple reading text. In the beginning, he was ready but he tried a little and stopped. I asked him why he stopped but he had no answer to it. He felt insulted in front of the class and flushed in anxiety. At first, he thought he could but as he tried he couldn’t because his reading skill did not support him. Majority of the students who belonged to public school had a similar story (perhaps, still have), a sad story of having difficulty in reading an English textbook fluently. This story reminded me to recall my first stumbling days where I put my full effort, mind and heart to memorize those individual letters ABC…XYZ without knowing what reading actually means. So, till the date, I remember the interesting way of our reading. We were taught to read word meaning in such a way, h-o-u-s-e- house mane (means) ‘ghar’ and gradually started to read sentences. Reflecting back to those days, what I feel now is that our reading in my time was probably focused on developing the ability to read English alphabets. Later, it was associated with the production of words and sentences than context, meaning and many more. So based on my experience as an ELT practitioner, I do not find any significant difference between past and today. No doubt that reading is definitely a skill, an active skill along with other three fundamental skills of language. Some studies (e.g Dabarera et.al, 2014; Ismail, 2015& Lee, 2012) related to reading skill reported that reading is one of the significant skills foreign language students need to learn for academic success in English. . .
Firstly, we were taught in Nepali even in English language class. Our teacher translated English text into learners’ native language (Nepali) as far as possible. As a result, we are compelled to think in Nepali and literally translated the language into English. This process involved the use of grammar-translation method in language learning and we are still practising it (nani dekhi lageko bani). In our English class, our English teachers used to explain the text into Nepali and asked us to memorize the difficult word meaning. When he taught a lesson, he followed the ethics of grammar-translation method. He read the text and translated into Nepali language, so did the students. Thus, we never felt that it was our English class and we were reading in English. On the other hand, we felt bored like my SEE students when their teacher starts giving a lecture in English class. The interesting thing happened in both classes (classes of my time and now) were similar where students requested their teacher to tell the text into Nepali. In this respect, I would like to add a statement of my SEE student. This is only the very common example. As we are using the Nepali language in most of the English class, it automatically creates a problem in reading. Throughout the observation, we experienced the same and even understood that students might have felt difficulty in reading due to the deep impact of the dominant method. There is a lack of concern and exposure of English inside the class. The contexts are also limited. It is my experience that the teaching and learning English in public schools is oriented to how to pass the exam. The students of public schools did not have exposure in reading from English teacher, parents and elders for developing reading skill since the past till now. So, reading becomes a complex process for them. The students do not know what makes them a good reader and what the right way of practice developing reading skills is. Another reason behind the lack of students’ motivation in reading is due to the lack of additional reading materials. Most of the public schools of Nepal do not have the access to reading room i.e. library in schools. Even though there is a library, students are not trained how to find appropriate books and read fluently. Moreover, lack of trained English teachers, lack of enough teaching aids students of the public school are poor in reading. If we could provide reading related book like English magazine, storybook, poem, drama and so on to our students from the early grades, there might not be seen such problems in the field of English language teaching. So, establishing a resourceful library is essential for the development of students’ better-reading habit. Similarly, the reason behind our students’ demotivation in reading (mostly in public school) is the teachers’ own reading habit. Therefore, teacher and their reading habit can be one of the sources of inspirations for the learners. I, thus, think that to improve the quality of present government aided education system and more importantly to develop the reading habit to the student, every school should establish a teaching community of practice. McLaughlin and Mitra (2000) emphasize that teachers’ community of practice is an important vehicle for sharing ideas and getting help from each other in their educational practice. I hope schools can be the best model for teachers along with their students for developing reading skill. In my view, only establishing a library is not sufficient to promote reading habit, but there should be an environment for reading community to enhance the better reading of their young learners. It means there should be a practice of taking children to the library, choose appropriate books and read, then share what they read with their friends and others. Finally, motivation is one of the key strategies a teacher can use to make his/her students sound in reading. Motivation has positive power for transforming individuals towards wellbeing, Therefore, I felt that at the beginning, mostly the students require a great deal of support and guidance from their ELT teachers. If they get the proper guidance and motivation, they can enhance their reading. Ms Roka is a recent graduate from the Department of English, TU. Her master’s thesis explores identity construction of female EFL teachers in Nepal. Dabarera, C., Renandya, W., & Zhang, L.J. (2014). The impact of meta -cognitive Scaffolding and monitoring on reading comprehension. System, 42,462-473. Harmer, J. (2001). The practice of English language teaching. London: Longman. Harmer, J. (2007). How to teach English. London: Pearson Longman. McLaughlin, M. & Mitra, D. (2000). Theory based change and change based theory: going broader. Journal of Educational change, 1(2), 1-24. Middleton, E (2011). Reading Motivation and Reading Comprehension. An unpublished thesis of Master of Science in Graduate School, Ohio State University. Richards, J.C., Rodgers, T.S. (1999). Approaches and methods in language teaching. Original (1986), Third Edition, Cambridge: Cambridge University Press. Wyatt, M. (2012). Issues in supporting the teaching of reading in English as a second language to Arabic speaking children. The reading Matrix.vol. 12, 2. I began teaching English some eight years ago in a way that I could not help commencing it as the profession. One of my friends requested me to take classes on her behalf when she was not able to continue teaching in the middle of the academic session. When I recall the first day, I was really nervous standing in front of the staring eyes of several students, though it was my luck that I was appreciated by them. The appreciation from the students and my own rewarding experience during this period motivated and encouraged me to take teaching as the career. In the beginning, I found many reading texts quite difficult to interpret to the students. I had had many sleepless nights to prepare those texts. In this short blog post, I share my experience of teaching reading texts in post-secondary level in far-western part of Nepal. During these eight years, I taught English in a few community and private English medium schools from secondary to university levels. I mainly collected experiences at the post-secondary level i.e. grade 11 and 12. I facilitated both compulsory and major courses of English which contain various genres of literature such as poem, story, essay, drama, novel and so on. While teaching these genres, I have gained some inspiring experiences. When I was teaching reading an essay “Look At A Teacup’, the girls of grade 11 hid their heads. Furthermore, they were seen absent the next day. I learned that the reason of their absence was the sexual context in the text. They did not feel comfortable with the content. I consoled them separately and made them feel comfortable. And I also adopted a rapid reading strategy for that particular text. However, I have had quite contradictory experience of teaching a story i.e. “About love” to the students of grade 12. The students were too curious to listen to me. I observed that they were found excited to listen to the story. They paid full attention with no hesitation and wanted me to translate the story in the Nepali language. I realized that the content about love attracts those teenagers. Another different experience was teaching a dramatic story “The Three Day Blow”. Students became quite passive and felt bored while reading the text thoroughly as it is too lengthy. They reported me that it has some unnecessary conversations. I made a summary of this particular reading. Then I realized that they made meaning in a way that love is like ‘The Three Day Blow’ at the present-day world. One different situation that I had gone through was while teaching a poem entitled “My Heart Leaps Up When I behold”. Even though it was simple and short, students became quite confused with this paradoxical line: The child is the father of Man. Later on, I changed the strategy to impart the meaning showing a chart to make the meaning clear and they received the hidden meaning of the paradox. I felt quite happy when they comprehend the figurative meaning and internalized it. Like other teachers in this region, I also faced a lot of challenges to teach reading texts regarding the contents, students’ behaviour, learning environment and teaching techniques. At first, I used to apply the lecture method. Later students’ progress and my deep engagement motivated me to use student-centred techniques to make students more active and engaged in their classroom and improve their reading ability. While teaching reading in one of the government schools of a remote area in the region, I had to face a lot of challenges because students were very weak in reading and writing in English. So, I used the Nepali language for every English words and sentence. When I read in English, they were startled and had no responses in the beginning. However, while I was reading something in Nepali, they were quite happy as they found the texts easier to comprehend and grasp the meaning of them. In that situation, I had to take extra (out of office hours) classes to facilitate reading and focus on simple grammar rules, structures, vocabularies and pronunciation of the new words. As English is a foreign language in my context, there is no doubt that everybody feels some difficulty to master over it. Children in the school coming from different linguistic and social background also feel hesitation and difficulty to speak English. Practice makes man perfect. In earlier days, I used to stay the whole night for reading, underlining the words and write down their meaning. I constantly scanned my own comprehension. This is not something happens at the end of every page but this happens at the end of every sentence. I was scared of thinking that what I should do if I do not understand what I am reading. So reading helped me to deliver the content confidently. I was particularly inspired to see my students’ progress in reading and I think, reading never ends. I feel that students need to be engaged in reading books of their interests, magazines, newspapers, stories, novels, comics and so on in Nepali, English and the languages they feel comfortable to enrich their reading habit. During these eight years, I find that reading allowed me to expand my knowledge, explore and understand my own identity and made my mind creative and critical. Ms. Yashoda Bam is a post graduate teacher (PGT) at Sainik Awasiya Mahavidyalaya, Teghari Kailali. This paper recounts my professional journey as a university teacher that I started nearly one and a half decade ago. In this narrative account, by exploration I mean textual exploration, experience stands for direct contact with language, working in and through language, and expression has to do with communicating ideas through writing. Underlying assumptions: i) learning ceases with over-repetition; exploration gives continuity and safeguards against fossilization; ii) language has to enter into and move through the experiential zone; iii) expression is vital for communication; communication failure leads to professional alienation. When I started teaching at the university, the entry requirement I possessed was the Masters degree. It was the only professional competence I possessed to teach Masters course. I had some level of confidence because I was going to teach the same course I had studied. The campus where I started my university career was like my home. However, I did not have extensive reading and writing experience apart from coursework, particularly the Masters thesis. My knowledge in the subject was limited. I was confined to the given course, but the subject I thought, for example, Translation Studies demanded interdisciplinary readings in Linguistics, Applied Linguistics, contemporary critical theories like post-structuralism. Apart from reading across these different subject courses, the courses also required me to have experience of translation. When I recall those early days, particularly the first two years or so, I was a course-teller rather than a teacher. Gradually, I felt more comfortable with the course content, since I had repeated the same course. Also, I felt more secure in the class. However, the lack of job satisfaction led to the devoid of academic charm. I was suffering from what Nietzsche has called “repetition sickness” (Myerson, 2001). What lies at the heart of my profession is teaching the prescribed courses to prospective English teachers. That is, my first and foremost duty is to stand in front of the class and deliver lectures to the students in the classroom. Other professional responsibilities include supervising researchers, training teachers, designing courses, compiling and editing course materials. Again, all these revolve around the key responsibility i.e. teaching. After some years when I started attending the conferences and visiting the academic forums and creative writing workshops, I began to realize that classroom teaching has limited reaching. I was alienated from the broader academic community. It often struck me that only by confining myself to classroom activities, I might not be able to expand my professional presence beyond university premises. Only by teaching one cannot grow professionally. This feeling would often strike me. To what extent can I call myself a professional teacher? Do I only teach or do I also READ? Do I only teach and read or do I also WRITE? Do I only teach, read and write or do I also SHARE? Do I only teach, read, write and share or do I also CARE the emerging writers? These questions were in fact inspired by Penny Ur’s (1991) notion of professionalism. The questions like these urged me to set on the journey of exploration, experience and expression by means of reading, writing and translating documents. I prefer not to limit myself to the reading and writing within my profession. I love plunging into the open space of reading and writing beyond the given profession so that I can traverse neighbouring disciplines, and bring back insights and information to expand and strengthen my profession. I have sensed that it has helped me expand my core identity as an English teacher. Apart from a teacher, now I can also call myself a writer and translator. Translation and creative writing have connected me to the broader audience. Reading is a process of exploring texts as well as information. I normally explore three zones of texts. I often begin with the core zone i.e. the texts prescribed in the course. It’s vital for my professional survival and success of my students in the examinations. However, reading the course texts is not enough. Then, I explore additional texts related to the core zone. I call them the texts from the peripheral zone. I need to deepen and widen my reading experience. To this end, I site the prescribed topic or text in the neighbouring disciplines like linguistics, literature, philosophy, and also refer students to such disciplines to broaden their understanding. Whenever I have time, I choose one of the areas and take to independent reading. I call this the texts from the outer zone. Let me give an example, poststructuralism and translation, a topic from the course. The course requires me to deal with the topic from the linguistic perspective only. Apart from linguistics, I move to peripheral texts that shed light on the topic from the literary and philosophical perspectives. Later I suggest students to carry out an independent study of poststructuralism when they have time. Thus, as an advanced academic reader, I encourage my students to move to the outer zone from the core. This exploration helps the reader experience the content and language from different disciplinary perspectives, with varying degrees of intensity. Moreover, it is the process of reading across the disciplines. With such exploration, we become the members of broader academic and creative communities. However, there is a risk involved in such a reading. The reader should not forget to return home i.e. his/her own discipline, say ELT in our case. The only aim of reading beyond the home profession is to enrich one’s professionalism in terms of language and content, not just to become a textual wanderlust. I realized, very late though, that writing is equally intensive and hard to reading, but it is also a source of self-satisfaction. This exploration needs more physical and mental preparedness, more commitment and more motivation than reading. While writing this article, I am exploring my inner and outer worlds simultaneously. Writing requires me to explore my own consciousness by reflecting on professionally who I am, what I am doing, what my expectations are, what my students expect from me, and how I can contribute to my professional community. In a similar vein, I need to explore relevant information available in the textual world to such questions. Writing is the combination of information that I collect from various sources. Writing is an event. It is the event that engages the writer in language, in content and in context. For example, I, while writing this article, am experiencing English directly. I am not just thinking about English but thinking in and doing through English. I am face-to-face with its components ranging from spelling at the lowest level to discourse at the highest. I always find myself in crisis while writing because every time I am unsure of spelling. I look for suitable words, proper structures, natural flow in the texture, effective rhetorical devices, relevant information and striking insights. Moreover, by writing I am linked with my students beyond the classroom. It has extended my presence beyond the classroom and multiplied the number of my audience. It has also helped me become a producer of knowledge rather than a mere consumer. Translation has been instrumental in shaping and expanding my profession in terms of language, content and my identity. My early inclination to translation was due to my desire to improve my English. Later this inclination morphed into a life-long passion and profession. When I start translating a piece of work, I find my English inadequate. So, I need to search English dictionaries for better words, suitable expressions, natural sentence constructions and effective rhetorical devices. It has compelled me to be a tenacious language learner. Moreover, supplementary reading is a must in translation. In order to translate a Nepali book in English, I need to read peripheral English books. For example, when translating Yasodhara, a poetic play in Nepali by Sharada Subba, I had to explore several books and even movies in Buddhism. That led me to the path to Buddhist literature. Old Path White Clouds is one of them. Apart from being helpful in translation, insights from reading of the books like this have broadened my understanding about life and my relationship with students. This book has changed my attitude to teaching as service rather than merely a means of livelihood. Moreover, while translating, I am engaged in the double helix of reading and writing. My reading is directed to writing. I need to read the text in the deepest possible level and (re)write it in the most accurate way. In both the cases, I am in intimate contact with language. Drawing on my experience, I agree with Sujeet Mukherjee’s (1981) revelation – Reading for translation is the highest form of reading. This acute process of reading has given me a means of expression. I have been expressing myself through translation for many years by now. I believe that I can contribute to the disciple by translating and writing about translation. Contribution to university courses: Selecting texts for such courses as Interdisciplinary Readings is next to impossible without wide reading. With this, I have been able to contribute to university reading courses, particularly in the text selection from literature, philosophy and critical theories. Exposure to language and content across disciplines: I find myself shuttling back and forth across different reading zones. It gives me a sense that I am studying about language, content and its style. This makes my reading interesting and exciting. I can directly experience English used in other disciplines. Such reading exposes me to a variety of language and content. It has helped me guide students, earn their trust. This has improved my English and given me content to contemplate, to teach and to write. Safeguard against professional lethargy: Constant reading, writing and translating has freed me from professional lethargy. Knowledge contributor: My role as a teacher is not only the consumer of knowledge but also the producer of knowledge. Sharing beyond the classroom. I have been able to share my ideas beyond the classroom by means of print and electronic media. Self-humility: Finally, the journey has taught me self-humility i.e. I don’t know but I try to know. Mukherjee. S (1981). Translation as discovery. India: Allied Publishers. Myerson, G (2001). Nietzsche’s thus spake Zarathustra. UK: Hodder & Stoughton. Ur. P (1991). A course in language teaching. Cambridge: CUP. We are delighted to present the third quarterly issue (July- September) of ELT Choutari of 2018, the 88th issue. The issue focuses on writing education in Nepali schools and universities. We, the teachers of English in schools and universities teach about writing not writing itself. For instance, students are made to memorise what a paragraph means rather than making them write a paragraph on different topics. In the university, many students strive to create original pieces of writing. To meet the dates for submitting assignments, students ‘copy and paste’ in rush. They do not receive enough opportunity to practice writing in the classrooms. On the other hand, in schools, teachers generally write paragraphs, letters and essays on the board and students just copy them. They even memorise those notes including essays for the examination. Furthermore, there are ‘ready-made’ paragraphs, letters, job applications and essays in the markets; the “Bazaar Notes”. In a way, these notes make the teachers’ lives go easy. Of course, there are few teachers and students who invest their sufficient effort to practice writing processes in schools and universities. Interestingly, it has also been observed that the teachers and university faculties who have never produced a single piece of original writing in their career grade the students’ papers for their creativity and originality in writing. I mean, do we have experience of the process of writing? We need to rethink and revise the practice of teaching writing in our academic institutions. In this connection, this 88th issue of ELT Choutari offers a wide range of writing practices, experiences and analysis of scholars. I believe that teachers, students and researchers will be benefited from reading these writings. I would like to thank Choutari editors Dr. Karna Rana, Jeevan Karki, Praveen Kumar Yadav and a learning editor Narendra Airi for their reviews to release this issue. Finally, if you enjoy reading the blog posts, please feel free to share in your circle and of course, drop your comments in the boxes below. Likewise, please write your teaching-learning experiences and send us. We will give a space at Choutari. Our email is 2elt.choutari@gmail.com. said that the toughest part of the study was thesis writing. They shared their success, failure, complexities and challenges they faced in terms of writing a thesis. When I approached that level, I was at a loss because I could not find myself more confident. However, I have always been prepared and concerned about this matter and became curious from very beginning. More, I often remembered my sister who used to share her experiences of writing a master thesis and energized me as thesis is ‘something especial’ which requires a lot of patience and handwork. Before approaching this level, I might not be more serious about this matter meanwhile a kind of feeling came in my mind like, oh my god, “it is a tough writing”. Keeping those things in mind, I prepared for it .As a result, I reached at its final result. During this journey of writing a thesis I experienced most suffering and stressful time, I feel like that a woman suffered during in labour pain. It was in the sense that I had no option escaping from it because I spent about a year for preparing this thesis and face several problems, challenges, dilemmas and fear since the early days of preparing proposal to facing thesis viva. These several painful moments during the process however made me strong and leads towards its successful completion. I could visualize my classmates and found the same inherent problem like me in terms of writing a master thesis. At that time our concern was on thesis ‘topic’. Though initially, I have no idea about thesis writing, yes! Of course, I have a desire to carryout out research quite differently than other (to be honest, till that time, I had no vision to carry out the research on totally new area and design, I don’t know why but it can from my inner heart my …..).Therefore, I have always been concerned about this matter with little knowledge about thesis writing since the very beginning of master level. Times flies very fast eventually, I approached to the first rehearsal stage of preparing research proposal for the partial fulfillment of assignment of research methodology subject. For preparing this proposal, like other friends of mine, I visited CRC and read out some theses and prepared proposal without knowing the real essence of writing well proposal. Actually, it was in third semester, without having proper knowledge on it I submitted to the Department. I was curious to know the feedback of my work. It is all because I was thinking that this work would be helpful for my further process of thesis writing. On the contrary, it did not happen to me. I neither got feedback from my teacher (initially he promised to return back with feedback) nor he returned checked copy. Feeling little depressed, immediately, after the completion of this project, I went to one of my senior teacher of our faculty and expressed my research interest. I shared my interest on doing research in new topic. Then, he advised me as, “sounds interesting! I wonder if you find the literature of that topic in our own ELT context.” He further added that he however might not be sure either I can …. Being confused, I remained silent because I had no more option instead of quitting it .Thus, I just quitted it and thinking on doing research in quite easier topic than earlier. Eventually, I appeared final exam and worried thinking about thesis topic. After the completion of exam, I immediately visited CRC and brought some theses and decided to carry out survey design research as others. The Department of English Education published the notice of thesis supervisor. I saw my name under the supervision of respected guru Dr. Prem Bahadur Phyak. I heard his name and his contribution in English language teaching. But, before that time, I had no formal visit to him. Some days later, he called a first meeting for a discussion. On that particular day, we gathered and discussed on general matters. My friends were sharing their ideas one by one after introducing themselves. When my turn came, I was really confused whether I could tell. Feeling little comforted I tried, but it went difficult for me to speak over there because before that time I never became serious about “area” and “topic”. Though I became nervous, I successed to speak something about topics, I brought. Meanwhile, he understood my intention, made me feel comforted. After discussing with him, somewhat I understood and got little idea on area and topic. I knew the area ‘gender’ but became confused how to carry out the research on it. I returned back home and laid down restlessly continuously thinking on it. But the question “how to carry” had drawn my attention. After a long debate within, I decided to do it and immediately requested to my supervisor for providing some materials related to gender. He immediately sent me a pile of reviewed works. Next day, I downloaded and printed out all, I had. Then, I started to read. I read and underlined the words which I considered most important. I read each article several times but became tired and frustrated when I understood nothing. However, I kept on reading. Gradually, we were called for second and third meeting for a discussion. In those productive meeting, I learnt many things but felt little uneasy because I was still in dilemma and not sure how to start and what to do later? Meanwhile, I saw some of my friends were confidently sharing their ideas .On the other hand, I found some of them were in dilemma (still) like me. Although I was in dilemma, I observed them and I felt little comforted. But till that time, I could not dare to speak. To be frank, finally, I tried to express my inner intention with my facilitator, ‘Sir, I went through all but understood nothing’. He simply replied, Nabina, “You show your interest on gender. Your issue is great. So, don’t be afraid. Be positive and just spend some more time on it”. This time, probably I felt little more comforted than earlier meetings. In such way, our last group meeting before preparing proposal was end with the discussion of choosing area, population and selecting research design particularly. Once I decided my area typically gender, having little knowledge about that field, I started working on it. As I mentioned earlier section, ‘I read but understood nothing’ later appeared as a milestone for me as it motivated me to do the work quite impressively. Keeping the quotation ‘understood nothing’ in my mind, I started to read. I spent about two and half months for reading and generalizing the ideas in my proposal writing. I had done it with paying full attention. Meanwhile, I found, it was as tougher as I thought. At that time, I encountered with several challenges. So, I had frequent visit with my facilitator and getting constructive suggestions for further improvement. Finally, I prepared the first draft of proposal and visited to my supervisor with little excitement. I handed this draft piece to him to observe my first attempt of writing a proposal. On the other hand, I noticed that my facilitator focus was on my writing ability than the particular topic (It is because, in our earlier meeting, he used to say that not to worry about topic. It may change according to the demand of the study during any of the phase of working). He spent sometimes observing it and commented on my writing skill. As I remembered his first question as, ‘why did you start with definition in your writing, Nabina…. ?” however, I did not have answer of it. I was really surprised and suddenly said to him, ‘Sir I found the same writing culture when I observed some theses and I did the same here’. (He laughs).Later, he had kindly awoken me. I got an exposure. During this discussion, I started getting more and more ideas related to language, content, related literature review, organization skill and methodology. It was the time he opened my eyes quite widely. On the other hand, I was embarrassed in front of him it is because I found myself in the very beginning stage of writing. As a result, I had to change my concept paper i.e. proposal for next time. On that day, our discussion summarized with introducing new word ‘identity’. Though, I fascinated by the word became worried thinking on my investment in preparing earlier proposal. Again I returned back home and stayed restlessly. I was really in dilemma what to do again. I immediately emailed him. He provided pile of articles related to teacher identity. During that time, I faced the same problem as earlier (but not exactly it was) as I did not have many ideas on teacher identity because it was totally new area than earlier for me. Meanwhile, I tried to read quite widely. I spent some weeks, losing my sleep, hunger and ignoring many more. Then, after reading some complex articles (In the sense that, I have not such habit of reading such article by heart, instead I read some just for reading, assignment purpose) about teacher identity, I consulted several times with my facilitator as it was really hard for me to make even a general concept on it. Having discussion with facilitator about the issues related to female English teachers’ professional development and more importantly as being a female ELTpractioners, exposure to the difficulties other working female(teacher) have in their personal and professional life, I started fascinated more by the term “identity”. This time, reading turned out quite enjoyable. But on the way to working, I felt bored and became somewhat redundant as I could not frame my ideas properly. During this phase, I had a several visit with him and expressed my problems as, ‘Sir I went through all articles but could not organize my ideas properly? He kindly advised me ‘you can’ but please does it passionately. I then determined and followed his suggestion, continuing my job of preparing proposal. Since that day, the word “identity” sounded in my mind (is still). After all, I spent another one and half month for preparing next proposal. During this phase, I worked hard despites the difficulties I faced. As a result, I successed to write all the parts except introduction. Again, I spent some more days for preparing the introduction part. During the whole proposal writing, I found that writing introduction was most challenging and time consuming in comparison to other parts. Finally, after a several draft, it was submitted to proposal defense. After the successful completion of proposal defense I did required correction by following the suggestion provided by the research proposal evaluation committee for further improvement. Since the days of submitting research proposal to the department even today I feel that starting writing had impacted in my several writing draft so it can be appeared as strong basis for writing present proposal for me furthermore, it extends my horizon of knowledge in the interested area and got the chance to be familiar with the recent practices and trends in researching and academic writing. My journey of data collection started after the phase of facing proposal viva. Regarding data collection, I was worried thinking on how it would be going on and whether I could find the expected participants. During the phase of proposal writing, I talked with some female ELT teachers whom I knew but later I found them being confused and trying to escape by remarking time limitation. So, I became worried and went to Pokhara .In order to fulfill the requirement for my research, I visited several public schools of valley. I asked help from my family and head of visited school to provide information. After the several days’ attempt, I met participants who were willingly taken part in my study. After a phase of planning. I provided them a written consent letter for getting ethical approval. Then after having agreement with them, I conducted my first interview in August 2017. I met with my participants individually for narrative session. The interview was conducted in different places, time and context according to their own comfort than mine. At the very beginning, I started the first interview session by asking more open ended questions, to make them feel free with me. So, I started the conversation with more general questions like what are you doing now? How do you feel right now? etc. I was inquiring in such a way for exploring their present experiences and more importantly, I did it for rapport building. Gradually, I entered into their personal and professional life. At the same time, I audio- recorded their each interviews. A month later, to explore more about them, I again needed their help. So, I had a telephone call with each participant for our second meeting. We again fixed our meeting for follow- up interviews. Gradually, this happened in first week of September 2017. In this session, our visit was on different places like their own home, school’s premise, coffee station and so on. At that time, we largely discussed about their personal and professional life. I mainly focused on the hindering and supporting aspects of their personal and professional life as it was the major objective of this research study. This time, we became more close to each other. So, without hesitation, they openly shared their stories though I noticed, they repeated the past events and even shared the events which they remembered during our ongoing conversation. (Feeling more comforted) In the same way, they even added new stories which they never shared to others. Listening to their unique lived voices, I lost myself with their lived stories and became nervous. At the same time we laughed and cried together. In this way, they not only shared their lived experiences, I also shared my growing interest on carryout out research on this area and growing journey of becoming a teacher. We talked for hours as there were no certain boundaries and fixed time. So, after having the interviews, I provided the question for written narrative. Despite their interviews and written narrative, I have a frequent visit to them on social sites. Furthermore, I observed their activities, facial expression as they were significant factors to explore their hidden reality of becoming an English language teacher. In such way, I collected pile of raw data. Data analysis started after translating (Nepali interview into English) and transcribing lengthy narratives. After two months rigorous hard work, I had prepared myself for data analysis and interpretation. When I stared to analyze raw data, I faced the same problem whether I would go further or escaped from it. Finally, despite the difficulties, I determined and did it. I collected data without having sufficient ideas on how to analyze and interpret them. I again glanced my eyes into the pages of narrative researches which I already have. I turned the pages of these books but could not find anything I needed and again consulted with my supervisor. He suggested me to follow the framework for analyzing narrative data. (To be frank) I actually didn’t know what would be the framework. I consulted several researches and become frustrated. Later, I went through the work of Riesman (2008) for a discussion of thematic approach to narrative analysis and adopted her ideas which I thought more significant for my research study. Few months later, I informed about my work to my supervisor. Until that time, I just completed fourth chapter of my thesis and visited with him. Few days later, he informed me about my work. On that day, he provided me more valuable suggestions as how to organize the narratives of participants effectively and how to put relevant literature in this part to make the research sound. Although I got the amount of exposure, while preparing this part, I encountered exactly the same condition as I faced during first proposal draft. I know, I am in the journey of research but I become really confused whether I would ‘go’ further or ‘leave’ it. Then, I remained silent for some days and looking for another simple way. However, I could not. I had no more option to quit it because I already spent half year working on it (faced proposal viva before 5 months). I tried numerous times and finally decided to continue. During this phase, I faced several challenges and lived through stressful time. Since interpretation to submission for thesis viva, I had numerous visits with him. Finally, through trial and error, I successed to arrive it’s completion and got its present shape. I discussed about my struggles, dilemmas and challenges I had been facing during this research project in the aforementioned section. More importantly, here I have presented these points as some consideration of my thesis journey. I decided to carry out this research entitled Identity Construction in Female English Language Teachers Professional Development: A Narrative Inquiry without having knowledge on this area, even I did not think that I might to carry out the research on this very topic. However whole thesis journey energized me and finally I arrived to my destination. Though I have no idea originally to this topic, later it went well. As a result, I found the work much more manageable than I thought it would be. However, throughout this thesis journey, I was spending most of my time working on this research project without having proper sleep, hunger, laugh and many more. It was therefore a very challenging (still is) stage and kept me going on and on. First, I felt quite easy to carry out the research related to female teacher because this research project was partly inspired by my own personal experience as being ELT practioners however researching on female teacher identity construction particularly is challenging issue for me. It was because “identity” itself is a new area and has not been researched in the context of Nepalese ELT scenario. Furthermore, I did not find the large amount of researches on this matter around the world teacher education.Infact, there were comparatively less number of researches, have given due emphasis on female teacher identity construction. So, selecting the area and carrying out research related to identity construction is challenging task. Second, we know reviewing literature play a significant role to make every research sound and fruitful. However, we did not pay due respect on it. People might say, ‘Once we prepared literature in proposal writing we might think that we need not to review it again’. Even, I heard such argument time and again from my friends and seniors. To be frank, not only them, I was not exceptional in this matter. Before approaching that stage, I have an ideology that it might be true. On the contrary, later, I know the value and its impact throughout whole writing. So, I realized that it is an ongoing process. Meanwhile, another concern of my study was related to proper organization of ideas. It was not only the problem I faced in thesis writing, I am still suffering, writing this reflection. Third, challenge I faced when I simply could not find the respondents for my research Though I talked earlier( when I was writing proposal)with some female ELT teachers later trying to escape from this research project by pretending for not having time. Then, I became little frustrated and again was searching for required participant for my study. Finally, after my one week hard work, I met some female teachers who were searching a place for sharing their stories. Again, I need to consider other factors like rapport building, conducting interviews, time management, selection of language used for interview and so on. Fourth idea which I considered is the relationship between researcher and participants throughout the whole thesis process. Throughout this journey, I noticed that in narrative research, the role of researcher is different from other such studies because of the relationship between researcher and participant. As I mentioned in third point, building rapport is the most difficult one in my early days and more concerned with whether I could build better relation to explore their hidden reality. So, I need to view myself both from insider and outsider perspectives. However, I did not forget my role in this thesis writing. Last but not least, another concern of my study was accurate representation of meaning in terms of what was expressed in Nepali and what resulted from translation into English. Maintaining core meaning and ideas of participants was a central issue for me. Therefore, I was always afraid of possible effect of misleading the interpretation of gathered data. During the whole thesis process, transcribing (took more than 2 month) and translating were most difficult tasks. In this way, despite the difficulties I encountered, my interactions with participants provided huge insights on exploring female teacher identity construction, their everyday experiences, contradiction, dilemmas, frustration they experienced in their personal and social life. More importantly, I understood the value of shared story in ELT teaching and learning and its impact in educational change throughout this thesis journey. After all, the final result made me more energetic as I had been working with ignoring many obstacles, challenges and complexities. To be honest, it was not my earlier goal to submit my thesis on this very topic. But, later due to my strong desire and more importantly the part of motivation which I had from my supervisor, I started my journey of the research in May 2017 within four female teachers who are teaching in basic level at different public school of Pokhara Lekhnath-Metropolitan city. Starting from first stage of selecting area, preparing first research proposal draft, facing proposal viva, conducting interviews, analyzing and interpreting data with finding out conclusion, I passed several joyful and painful moments which sometimes motivated and frustrated during the whole process of working. To be honest, most of the time, I experienced the painful situation and no doubt that I was writing from the level of ‘fear and dilemma’. In fact these dilemmas and fear later made me strong and confident. Most importantly, throughout my educational journey, this firsthand experience enabled me to understand the real value of study from school days to graduation. Next, during my working days, I observed some of mine friends carried out their theses within limited time and even I heard the thesis, “selling and buying” culture. Yes! Honestly, I am not sure about this rumor but was afraid of it. Instead, I want to say to you all that definitely you have to tackle with many ups and down moments like me during thesis process and you may deserve the result of your hardworking. So, I advised to all prospective researchers not to scare about word “thesis”. You must understand the essence of writing thesis before started writing further. If you do that it will be easier for your further steps. Further, people I met often told that everyone writes thesis but it does not matter how you write, the goal of writing a thesis is just for getting marks than nothing else. Instead, my stressful time provided me an insights on what is thesis writing in real sense, what is my role as a researcher? Somewhat I got the chance to be familiar with little about thesis writing. Thus, I would like to suggest to all fellow students, you must grab thesis writing as a learning opportunity as you will get the chance to enlighten you and your knowledge on your interested area. Now, I am at the end of this reflection writing, at this journey I highly indebted to those generous souls whose collaboration makes this journey of knowing mine and others’ possible. Most importantly, I would like to extend my sincere gratitude to my respected guru and thesis supervisor Dr.Prem Bahadur Phyak, for his sound professional guidance, full attention, timely advice, expertise and encouragement throughout the whole thesis process in spite of his busy schedules and over whelming responsibilities. I am really grateful to him for everything. More, I have a due respect to all research proposal evaluation and thesis approval evaluation committee for their support and encouragement in completing this research study. I have a due respect to Prof.Dr. Tara Datta Bhatta for his encouragement and enlightening ideas on language .Similarly,I would like to offer my sincere gratitude to Prof. Dr. Bal Mukunda Bhandari for his invaluable suggestion. I would equally offer my sincere gratitude to Mr. Laxmi. Pd Ojha for being there and provided suggestion for further improvement. Further, my entire research would not have been accomplished without the help and support of my participants. So, I have a due respect to them who believed me and enthusiastically taking part in this study. Ms. Nabina Roka is a recent graduate from the Department of English, TU. Her master’s thesis explores identity construction of female EFL teachers in Nepal. British Council has recently published a book titled “English Language Teaching in Nepal: Research, Reflection and Practice” (2018). This volume is edited by Dr David Hayes. He is an associate professor at Brock University, Canada and an independent education consultant. This book is divided into three sections. First, international perspectives (on ELT), which includes the papers of Rhona Brown, Pritivi N. Shrestha and Amol Padwad. Second, Sponsored research studies, which covers the other three papers of Min Bahadur Ranabhat and Subodh Babu Chiluwal, with Richard Thompson. Finally, the third section- Case studies includes the eight case studies of Ushakiran Wagle, Eak Prasad Duwadi, Laxmi Prasad Ojha, Jeevan Karki, Gopal Prasad Bashyal, Ashok Raj Khati, Laxman Gnawali and Vaishali Pradhan. As the volume is out in the market, we thought of sharing the thoughts and reflection of the editor in editing the valuable volume. I managed to briefly talk with Dr. Hayes. Jeevan: Dr. Hayes, you have recently edited a volume “English Language Teaching in Nepal: Research, Reflection and Practice”, which includes 14 chapters. Based on this valuable experience, what is your reflection on the writing of Nepalese ELT practitioners? What are the strengths in their writing and what could be done to make their writing even stronger and better? Dr. Hayes: Nepalese practitioners are experts in their contexts and my job was just to help them to clarify their ideas and put everything together in a way which allowed them to make their contributions to the book the best that they could be. The strength in the writing generally was in bringing the Nepali school contexts to life so that readers elsewhere could see what was positive about teaching and learning English in Nepal, what the challenges were and where improvements could be made. Good writing is really all about practice and knowing the requirements of the publication you are writing for and its readership. Nepalese practitioners just need opportunities to be given- opportunities to write and to publish for both local and international audience. The more they write, and the more editors (of journals and, I hope, more books like ‘English Language Teaching in Nepal: Research, Reflection and Practice’) help them, the more proficient they will become. Jeevan: Having gone through the research and practices in Nepalese ELT, where do you locate the ELT practices in Nepal in relation to the trends and practices in the world? Dr Hayes: I think it’s always best to look at ELT practice in terms of how appropriate it is to the local context. However, there are clear trends which are present in Nepal just as in other countries worldwide. The most obvious of these is the expansion of English-medium education, even at the primary level. Personally, I don’t think this serves the interests of the majority of children well. International research shows that children are most successful educationally when they are taught in their first language and become literate in that language in the early years of schooling. Of course, this is a challenge for multilingual societies like Nepal but experience elsewhere shows that primary education in the first language can be achieved and, not only that, children are often more successful at learning another language such as English in later years too. The danger of English-medium education when the language is not available and regularly used in the local environment is that children often end up not learning anything very well. The work of the Language Commission in Nepal is extremely important in this respect. There is, of course, still a place for English language teaching but I think there needs to be some serious reflection about its place in the overall education system in Nepal. The educational interests of the children must come first. Writing is a rigorous process. A good writing needs enough practice on the part of the writer. Moreover, academic writing is well organized and needs good effort. As a part of the academic course, I carried out a research on “Feedback in English Language Learning: Teachers’ Practices and Students’ Perceptions”. I went through several hard times during this research. The problem began from the very starting day of the writing process. The foremost problem I faced was to find out the way out for finding out the topic that I was interested in. It was not that easy for me to find out the area of my interest on which I was about to carry out the research. Hardly, I decided to do my research on a given topic. The topic suddenly came in my mind when I reviewed many available literatures related to language teaching and learning. Going through several literatures, I came to know that the role of feedback cannot be neglected, especially, in the process of second language learning. As being a student of semester, I was thinking of the feedback practice at the university. I wanted to find out whether the students are receiving effective feedback in the classroom or not, whether they are satisfied with it or not. What different ways are there to provide feedback to the students? These all led me to choose this topic. Literature review is the most important aspect in any research. You can guide your research very well if you have good review of literature. Review helps to find out the gap in any area. Moreover, you can come up with the contrasting idea after the review of the literature. Finding out the appropriate area of interest in any research is challenging to any researcher. In the same way, I also went through several sleepless and stressed nights thinking over the area of my interest in carrying out the research. Several nights, I wandered in dream of finding out the suitable topic for my research. I used to dream of the same thing-research topic but forgot after I woke up. I myself didn’t know in which area I was interested in. It took me a couple of weeks to think about the topic. At some point, I thought that I could not do. But then, I gathered the courage to do it. And finally, I decided the topic. The journey of carrying out research did not stop there. It was just the beginning and a lot more was to come. When the topic suddenly came into my mind, I became so happy. But the happiness did not last for long as I thought of the whole process of writing it. I was like…(कुहिरोको काग). Sometimes, I thought that I took it more seriously than it needed to be. But the other times, I thought that it was ok! At some point, I thought that it was not of my reach. I thought like I was lost in the ocean. Sometimes, I thought of changing the area of research. But when the whole struggle of coming up to that level came into my mind, I forgot the idea of doing so. I had my own kind of mental map when I planned for doing my research. I wanted to do it on my own way. But the turmoil came when I asked my supervisor about the topic and he led me to other way. This made me sad again-so sad that I stopped working on it for several days. But ultimately, it was my work and I had to do it at any cost. I started working with the proposal again. I worked to first, second and third draft giving it to the final shape. During the process of writing these all the drafts, I took support and guidance from my supervisor, teachers and my dear friends. When my proposal got the final shape, I felt like achieving a great victory over the enemies. It was the day I took a step forward. It was half done but there was a long way forward to go. And the paths were not that easy. The paths were not pitched-graveled, sloppy and spiky. I stepped back many times and it took me several weeks to move forward. Collecting the required data is the next challenge in any research. I wanted to do my research through the questionnaire and classroom observation of the teachers. Collecting the data taught me the next lesson-the lesson of sketching all the possible future before the task begins. A single prediction may not work as a whole. So, what a researcher needs to think is that there are many alternatives way forward and these all should be kept in mind before conducting any research. I wanted to do my research based on the classroom practice of the teachers and simply through the perceptions of the students. But, I failed many times in getting the right idea of doing so as I lacked the prerequisites necessary to it. So, I learnt the lesson of looking out for the multiple possibilities of any result. A single lens does not suffice a good research work. I also thought of changing the whole research work as I was quite unable to collect the required data from the sample. The problem added when I could not collect the data from the respondents. Hardly, the respondents returned back the filled up questionnaire. So, good rapport with the respondents is also a part of survey research. I myself was not satisfied with my work. But then, hardly, I collected the required data from the respondents and the observation of the classes. The data were not of good quality though. After the collection of the data, I met my supervisor time and again for guidance. I was lost for almost more than a month for the analysis and the interpretation of the data. Looking out the ideas from the teachers and friends, finally, I came up with the first draft. It was very rough and incomplete. With the help of regular guidance and support of the supervisor, I did it. Working with the first, second and third draft, I came to the final version. Even after the final version, I thought that I was missing somewhere. Doing good research itself is challenging and the tag of good student added more challenge to me. So, what I feel sometimes is being good is always challenging. Everyone has their eyes on you. It adds to your stress-stress not only in your research but in every step of your academic journey, eventually personal! Sorry! Being somebody is always dangerous! 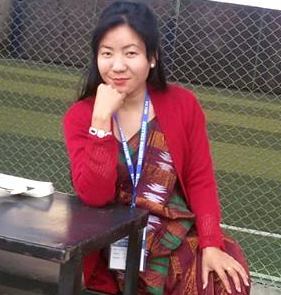 Ms. Tara Rai is a recent graduate from the Department of English Education, TU. Her master’s thesis explores the practices of providing feedback in ELT. One of the most common activities that we do on a daily basis, and do it in increasingly more ways for more purposes, is writing. But writing for us is also like water for fish. “What water?” one fish might ask another fish that starts talking about water, unless the latter has been thinking about or deliberately observing water surrounding it. Likewise, most of us don’t pause to think and talk about writing. It is just what people do, and they have habituated, often fossilized, thoughts about it or have nothing to say. That means it’s important for us as educators to think about how we are going to meet the increasing academic, professional, and social demands of writing in Nepal. In this post, I’d like to share some thoughts and experiences, and a particular vision, about how Nepalese academe could adopt and advance writing as a discipline and pedagogy, as a profession and vocation within the academic context. I am not thinking about creative writing, the writing done by the special “writers” within the humanities, or the writing done by a few “scholars” in other disciplines. Nor am I thinking about writing done by journalists or other kinds of professionals who write for a living. I am thinking about writing as a subject, like social studies or math in secondary school, and like compulsory English or particle physics in college. How can we advance writing as an independent subject that is taught by academic scholars or teachers who have studied it as a subject? How can we advance scholarly conversation and research about writing, in its academic and professional forms, for improving its social and economic applications? How can we develop writing as a field of study and practice, as a matter of curriculum and policy, as an issue of public awareness and demand? How can we help our schools and universities adopt systematic teaching, research, and training of teachers and other professionals around writing as a foundational part of secondary and higher education, as a vehicle for professional development? How can we write a writing education of our own? We do currently have a writing education of sorts. It exists in many forms, many contexts, many manifestations. It is not a separate subject/curriculum taught to students across the board; there are only a course or two within disciplines like English Education. Writing should be a distinct subject, or at least a part of “writing, research, and communication” skills course. Instead of considering writing as one of four language skills and taught within English or Nepali language courses, we must add academic writing as a foundational course in high school and college. We must offer specialized and/or discipline-specific writing courses, such as professional writing to help college and university students prepare for different professions, scientific writing and technical writing to help students write well in STEM (Science, Technology, Engineering and Mathematics) and engineering, and writing courses for students who want to pursue academic careers in social science and humanistic fields. We also need academic and professional writing as a set of courses that form undergraduate writing major. And in order to produce writing teachers and scholars/researchers, we need writing degrees at the Master’s, MPhil, and Doctoral levels. We need departments of writing. We need conferences, journals and professional organizations for writing teachers and scholars. One key question is what discipline is going to adopt writing, whether a new group of scholars are going to emerge and advance writing as an independent discipline, what shape our version of the discipline and profession of academic writing is going to take? Indeed, how do we characterize the courses/curricula and professional expertise in writing that we already have? Are the writing teachers, most of whom do not have specialized degrees or extensive training in the teaching and research of writing, going to lead this charge? Should they be connected to the broader community of writing scholars in the outside world? Are they and their new discipline and professional community–if such things are emerging or emerge in the future–going to be housed within another discipline, such as English Studies, English Education, or Applied Linguistics? Should a discipline and pedagogy of academic writing be limited within the context of English or Nepali for that matter? If so, what do the disciplinarity and linguistic identity of those other disciplines mean to the advancement of writing as a (sub)discipline and to the development of scholars/teachers with a distinct professional identity? While putting in writing the chain of thoughts above, I was also thinking that we are yet to develop a significant understanding about writing–whether in our conferences and journals, blogs and other professional discussions or through curriculum change and teaching practices. As I indicated at the beginning of this post, Nepalese academe seems generally vague about academic writing, perhaps because it is not interested in this subject and only pay attention to it when there is a crisis. Writing is like a machine that people only talk about when it breaks down. Teachers talk about students “poor writing” when students fail in exams i.e. if they don’t assume that the students would have written perfectly if they knew what to write but writing mediates and can make or mar both the process and product of learning and assessment. It can open or close doors to the profession and often social success. Writing is not only a means of assessment in our education system–in fact, too much so–but also plays increasingly important professional functions. It is a means of democratic deliberation and participation, playing increasingly important roles there as well in a young democracy. And writing goes beyond professional application and social/civic action to empowering the individual in an era of rapid technological advancement and globalization where we conduct more work and communication through writing. So, it is time to challenge and reject problematic beliefs about writing in their place, teach and advance better understanding about the roles that writing plays in practice in today’s society (as well as academe). For instance, if we look at the so-called “genius” students, it is often because they know how to express and organize well what they know, through writing. They have a better grasp of the connection between reading or research and writing. They read and write rhetorically consciously. But these facts are lost on teachers and institutions alike because of the prevalence of many myths about writing. Writing, many assume, comes naturally to individuals with a creative bent of mind. In reality, scientists who publish the results of their systematic research aren’t creative writers; nor are economists, journalists, or historians who are prolific writers. Writing is also often seen as an unteachable skill, one that must naturally emerge from regular reading, sustained practice, or just waiting until one has to do different kinds of writing in the “real world.” Learning to write happens, that is; there’s no need to teach writing. These assumptions and myths about writing take us back to understanding the nature and function of writing that we do or need. They prompt us to study the writing that our students must do, identify their struggles and failures and strengths, develop curricular and pedagogical strategies of intervention, put pressure on curricular and educational policies to recognize and integrate and support the teaching and study of writing. We must develop curricular models that will fit our own national and local contexts and needs. But we must also advance advocacy and education about writing–and that is what I mean by “writing” a writing education. There is a need for those of us who are interested in making Nepal’s writing education visible, in promoting it professionalizing it, to come together and share our experiences and visions. There is a need for us to develop selling points, to show the exigency, to demonstrate the benefits of a more systematic and advanced writing education in secondary and tertiary education. It may not be the same discipline that we see in North America or Europe, or even in the rest of South Asia. It has to be built upon the expertise and resources we currently have, the demands and needs we can identify through research and exchange of ideas and practices. It is high time that we bring together those who are interested in and invested in teaching and advancing writing otherwise into a professional network or organization. This can help us educate other stakeholders about the benefits of teaching/learning writing more substantively, more systematically, more purposefully. It can help us show its applications that already exist, the gaps and pitfalls of how the teaching/learning of writing is currently done. We are yet to demonstrate to academe and the professions alike the importance and needs of well-developed writing skills in our students and our professionals. It is time for Nepal’s writing teachers and scholars, in whatever proportion they would assume this academic/professional identity, to study and write the history of writing education in Nepal. We must understand and communicate what we have done well and what we haven’t. Collective action and ongoing conversation about academic and other forms of writing can also help us develop the arguments, the curriculum, the pedagogy, the practice, and the advocacy that we need for engaging other stakeholders. Together we can understand the uptakes, identify and try to overcome the obstacles. It is high time. This review is based on the interview which was published in April 2018 issue of ELTChoutari. Ashok Raj Khati, one of the editors of http://eltchoutari.com/ has explored significant ideas on academic writing from the interaction with scholars working in different universities of Nepal. The structured interview is centred on the university programmes which provide students with opportunities for learning skills of academic writing. It also highlights research and writing culture in the universities and publication habit of academics in their profession. The interview also raises the issue of plagiarism in Nepali academia. The majority of academics in this interview emphasise that the formal courses they have in their universities can develop students’ academic writing skills. However, Khadka, Chairperson of English Subject Committee at Mid-Western University, Nepal, values the ELT club of students, which is a community of learning, to develop their writing skills. Students’ participation and presentation of their writing in seminars and conferences are highly focused by Gnawali and Ojha. Teachers’ feedback on students’ writing is focused to improve writing skills. However, developing students’ academic writing skills is a challenging job of university teachers in Nepali universities where the majority of students enrolled in English education come from government high schools. The students learn the English language in their schools as a subject among other subjects. Nevertheless, Negi doubts the scholarly qualification of university teachers and their learning and teaching habits who lack broad academic knowledge and extensively use diary notes to deliver lectures instead of teaching skills. Gaulee criticises university teachers for not providing feedback on students’ writing. He suggests the teachers need to value their salary for teaching life skills for students but not just for grading their level. The academics in the interview highlight plagiarism in the works of academics and postgraduate students as a serious concern and a major issue in academic discussions in universities. Gnawali presumes that scholars plagiarise in their scholarly writing generally for two reasons: an intention to get quick promotion and lack of knowledge about how to acknowledge the sources. And the lack of enforcement of the law against the academic crime seems to be a loophole to allow the growth of plagiarism. Negi suggests the use of software to prevent plagiarism and discourage such activities in the authorship of academic publications. I believe that the academics’ arguments, ideas and suggestions signpost the demand for reformation in Nepali university programmes, the need for international standard academic writing and the development of research culture and publication. The issues raised in the interview and the suggestions made to improve academic writings and publications in Nepal are genuine and significant if academics realise these in their professional activities. I reiterate the ideas of Gnawali and Gaulee that the honesty in knowledge and fair in sharing ideas in all kinds of academic publications should come first before thinking about earning money. However, the academic practice in Nepali universities is still based on Gurukul tradition, where chela (learners) just follow what their Guru (teacher) says. This culture is well maintained in academic writing and publications too. University lecturers and even professors compile contents from several sources based on the syllabus to prepare a book, author the book and insist undergraduate and postgraduate students to purchase their publications. None of such publications is ethical as the authors copy and paste contents without acknowledging the sources. Such publications are not standard because the information gathered in them is neither genuine nor authentic. So far I know that the majority of standard journal articles and books in international academia are voluntarily written, reviewed and published, although few publishers charge little amount of money to cover the cost of press and distribution. Academics in Nepal need to learn about it and transform themselves before thinking to bring change in academic activities. Except rare recent graduates from local and international universities, who have been working hard to transform piracy academic culture to research-based original publication system in Nepali academia, the majority of university academics need to learn tangible academic skills and reflect their both soft and hard academic skills. Soft skills refer to social skills such as honesty in acknowledgement, fairness in information and unbiased criticality and hard skills refer to writing skills such as selection of academic language, organisation of ideas and presentation of information in an article or a book chapter. If you want to publish your thoughts on Choutari but need help with your writing, DON'T WORRY, WE CAN HELP TO REVIEW, EDIT, & PUBLISH your ideas. --- Please email us your article related to ELT or Education at 2elt.choutari@gmail.com or eltchoutari@gmail.com any time.